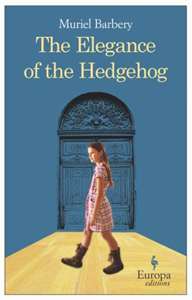 “The Elegance of the Hedgehog” by Muriel Barbery is a collection of essays about beauty, art, life and movement wrapped around a heartbreakingly bittersweet story of acceptance, love and grace. In order to keep up her “expected” role as the dowdy, stupid concierge at an upper-class apartment building in Paris, the uber-intelligent Renee hides her love of music, art and literature. Her wealthy and snobby neighbors look at her with disdain, if they look at all. Enter a wealthy Japanese man who sees both of these women for who they truly are–and changes their lives forever. If you like a mindless read–this isn’t it. The writing is elegant, well-crafted and describes what makes life beautiful; what gives life meaning. It took me a while to get into this book because I REALLY had to pay attention, but about 70 pages into it, I was hooked. This story will break your heart, so have some tissues handy. 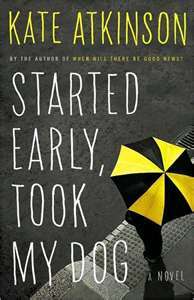 Kate Atkinson’s “Started Early, Took My Dog” is a collection of happenings revolving around 3 main characters. When Tracie Waterhouse sees a mother abusing her daughter in public, she decides to buy the girl and take her home. This choice escalates into a series of adventures in Tracie’s previously unexciting life. Jackson is a private investigator who witnesses a man abusing a dog in public. He rescues the dog and takes him home. Jackson is trying to find a woman’s biological parents: but nothing adds up. He encounters a mystery almost 40 years old and makes a few enemies. Telly is an aging actress with dementia who just landed a part in a TV series. Very good (and sad) depiction of a character who is literally losing her mind. These characters wind in and out of each other’s lives, never quite connecting, but still affecting each other immensely. Sometimes the story was hard to follow because it jumps back and forth between characters, and in time, but then sometimes I find the nightly news hard to follow.